For those unaware, emojis have originated from Japan and decipher as picture (e) and letter (moji). The pictograms have soon become popular and travelled to the Western parts of the world. The icons were introduced to iPhone along with the iPhone launch into the Japanese market – as a part of Japanese culture adoption process. Soon adapted by iPhone users form other countries as well, emojis have become the indivisible part of texting and emailing nowadays. Apple has significantly extended the emoji icon assortment with the new iOS 6, comprising the two gay and lesbian icons that were missing in the previous versions of iOS. It’s the first time, gay and lesbian couples are being represented in the emoji palette. 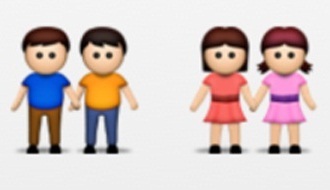 The new emoticons are placed beside the already existing heterosexual couple and heterosexual couple with a son. One of them shows two men holding hands and the other shows two women in the same position. Moreover, there is no child in tow, in difference with a heterosexual couple with a son just to the left… However, there is no doubt that the new icons represent couples with non-traditional sexual orientation, as they’re aligned in a “relationship” row… What do you think can be the reason for that? Do not hesitate to express your opinion below in the comments. Did the Solar Panels Cause Apple Fire?